It’s the day after Thanksgiving so you know what that means!!!! Time to decorate! My family started decorating almost a month ago… But, I feel like it’s an appropriate time to share now. Also, if you want to get in the holiday spirit make sure to go see the new Grinch movie. It was SO good and crazy adorable! Last Christmas my family was building our house, so we didn’t have a tree set up or many decorations. We went all out this year and I’m so excited to share! My mama gets a lot of credit for the decorations downstairs, and I’ll take it for my bedroom! Most of the decorations are from Hobby Lobby that I will link below, and the fireplace mantel lights are from Costco. 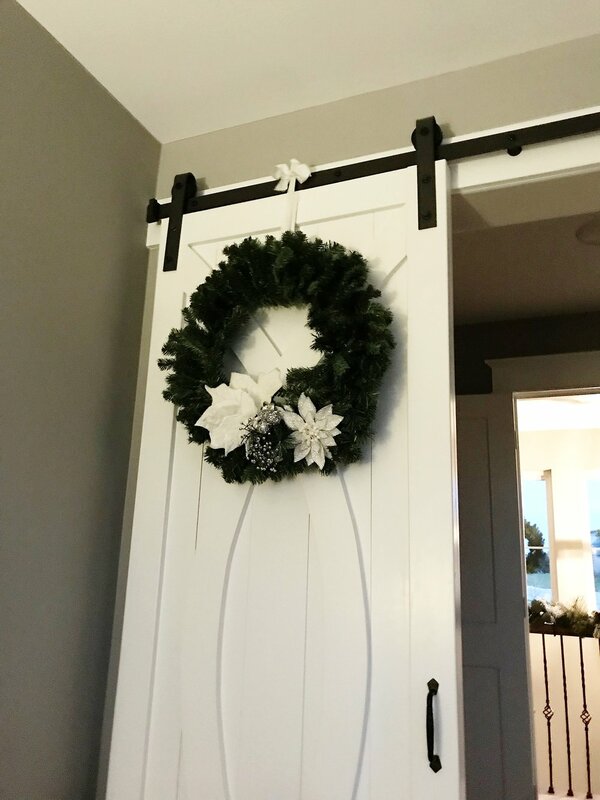 I wanted to add this wreath to my barn door, but I couldn’t find a thick enough hook to fit over… So, we tied a ribbon around and made a cute bow at the top. 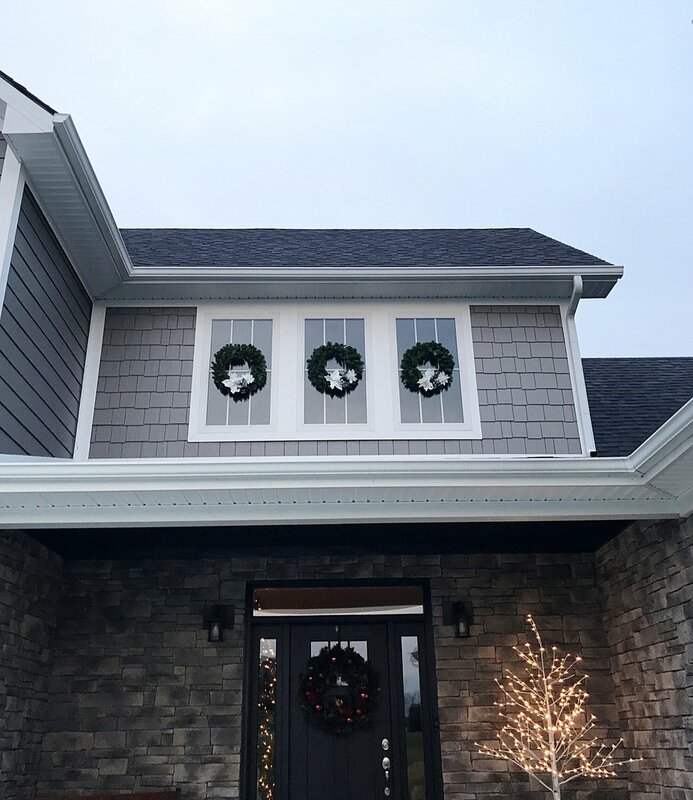 We also got the same three wreaths and put them up top in the foyer windows! The wreaths were only $6 and I bought little flower pieces to tie into the wreath to decorate it! Super easy and each decor piece was about $2. 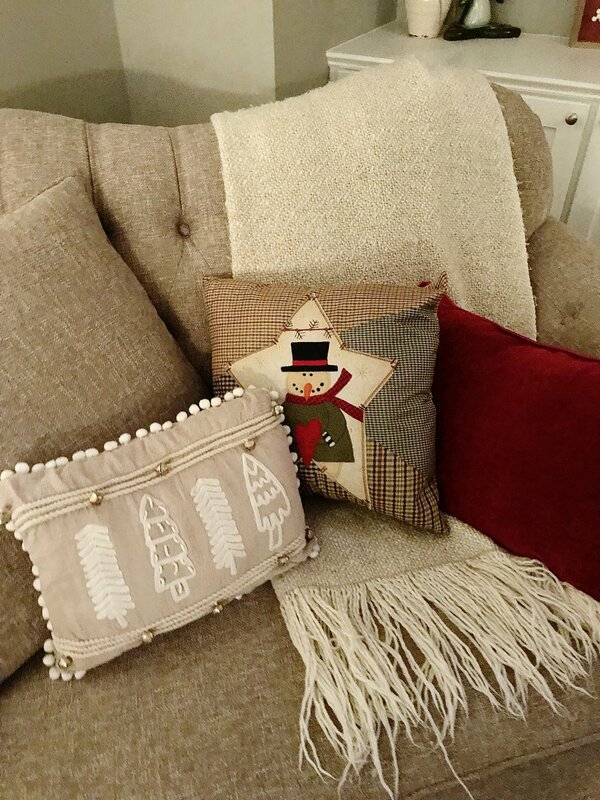 These pillows are from Hobby Lobby and Pier 1! They have a bunch of festive pillows and blankets to choose from for a great cost. We got a red and black thermal sherpa blanket there too, but my pup was laying on top of it so I didn’t take a photo. The lights on the fireplace are from Costco! We already have a lot of green garland in the house, so it was nice to change it up here. This piece makes the room so cozy and has the perfect light when the main lights are off. This garland is SO pretty! I love the pinecones and ornaments along it. We used two pieces to cover the rail and tied it down with garland flexible ties. These ties are awesome because they blend into the garland and looks good no matter what angle you’re standing from. We’ve had these candlesticks forever and were about to get rid of them so my mama decided to paint them! I believe she used spray paint and then added glitter on top. They’re perfect for the holidays! This was the first year I got a little tree for my room and I am obsessed! I love laying in bed and seeing my cute, decorated tree. I got this at hobby lobby for 50% off so it came to $75. It has cute snowy leaves, cranberries, and pinecones, too! I got my ornaments from Hobby Lobby as well and stuck to a silver theme. Last we have a cute holiday table piece! This is once again from Hobby Lobby and adds the finishing touch to the kitchen area. It’s a good size and continues the silver pattern throughout the house!